Featuring ultra-precise cutting abilities, the DLF Series solutions easily produce beautiful full-bleed labels. The DLF-220L and DLF-350L can also laminate labels for added durability—no need for special label media. All systems have advanced plotter cutting technology. This allows you to cut different types of material and shapes, on the fly, without the additional cost of dies. They are also equipped with a cutter management tool/camera black-mark registration system. This provides cutting speed optimization without synchronization issues. The DLF Digital Label Finisher Series enables your company to produce short-run labels in-house, reducing inventory requirements and their associated costs. Enjoy additional savings by eliminating pre-cut label rolls and minimum gap requirements when printing in full bleed. 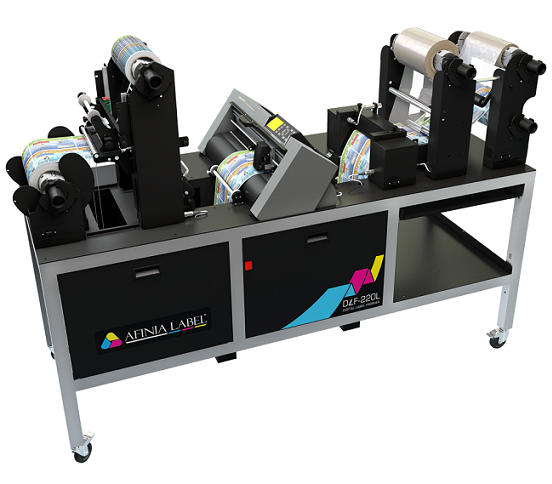 The Afinia Label DLF Series includes all-in-one systems that unwind, laminate*, knife cut, remove waste, slit, and rewind in one simple process to create professionally finished labels. These solutions are perfect for on-demand, short run label finishing from digital color label printers. Please refer to the comparison chart below for information on each product’s specifications. The DLF-220L and DLF-350L laminate (with or without a liner) for added label durability. The DLF-220 does not include lamination, and is ideal for businesses using pigment-based ink, or laser technology printers (water and fade resistant).